The crossroads between Argyle Street and Nathan Road in Mong Kok is rather impressive both by day and by night. I would tend to compare it to the famous Shibuya crossing in Tokyo. Here is a picture taken at the crossroads between Argyle Street and Sai Yeung Choi Street South, ie really close to Nathan Road. 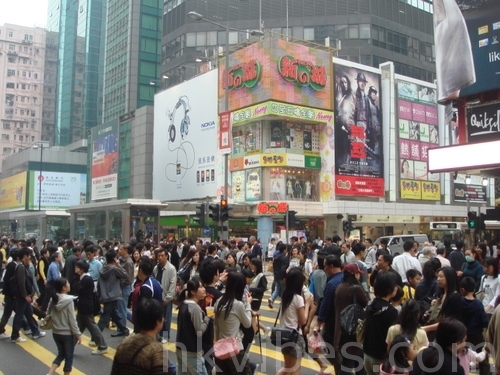 Having been to Tokyo and especially on the Shibuya crossroads, I do feel there is more concentration in Mong Kok than in Tokyo, but this may be due to the fact that the Shibuya one is wider than the Mong Kok one. Anyway I should post a picture of my Shibuya experience soon on the Hong Kong blog! Wow that is crowded. Like New York City. Seems fun though to live in a big city like that.